ah, friday date night. always a fun time. after 2.5+ weeks of constant travel for josh & i, we definitely were in the mood for some wining & dining. and i knew just the place. everyday on my way home from work, i drive past two, located at the corner of may st. & grand ave. over the past 4 years, i've seen at least three restaurants go in and out of that location. but two has stuck around. aka, time for us to check it out! so first ... the people at two are incredible. 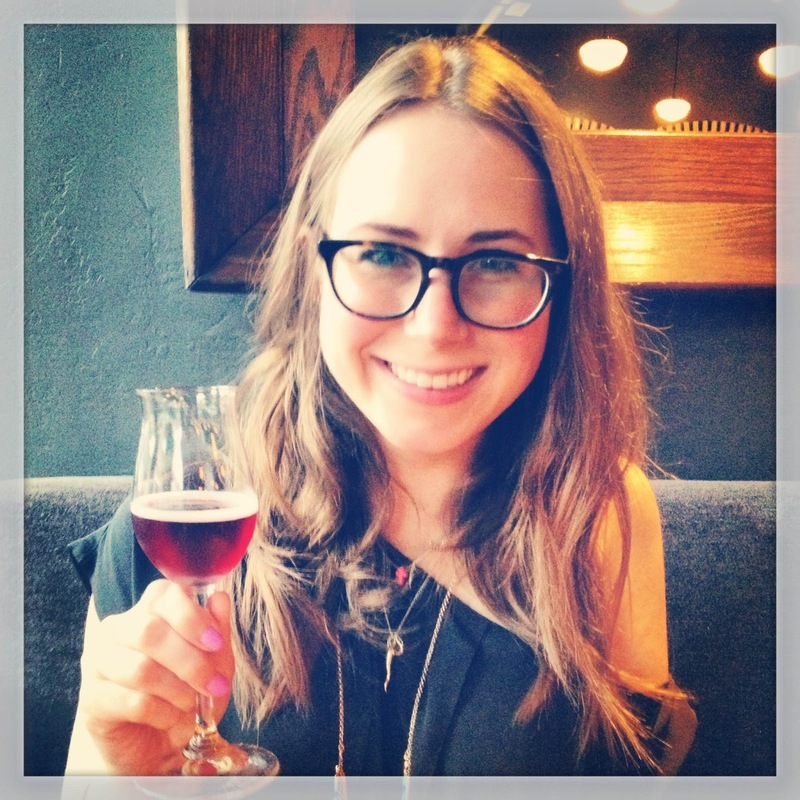 so knowledgable, friendly... and just actually interested in you/your dining experience. this is something i definitely appreciate. "chefs tom van lente & kevin cuddihee use rural midwest inspiration & infuse it with urban finesse. the 'medium plate' menu changes frequently to include wholesome, seasonal ingredients that you would find at a local butcher, farm, market or fishery." hi, perfection. 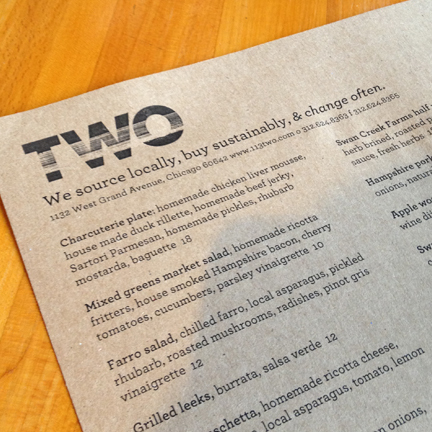 "we source locally, buy sustainably & change often." 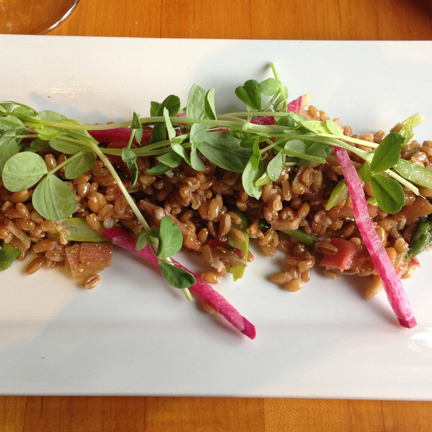 chilled farro, local asparagus, pickled rhubarb, radishes & pinot gris vinaigrette. 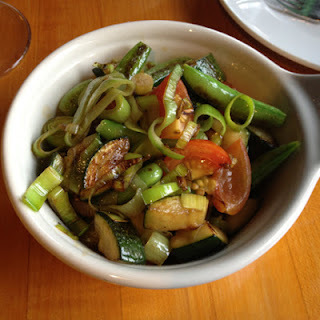 zucchini, leeks, shallots, snap peas & cherry tomatoes. roasted veg perfection. clearly super fresh & prepared beautifully. also already vegan & on the regular menu! 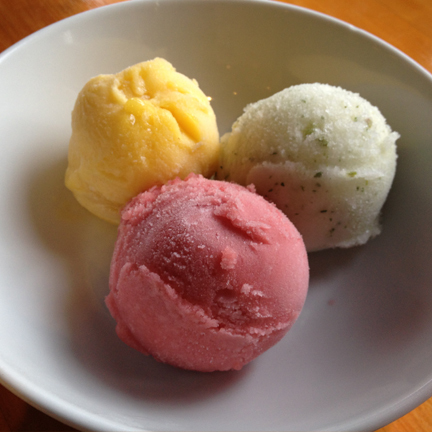 mango, lemon mint & strawberry. holy sorbet heaven. the lemon mint was sooo good. the reason? the mint was actual, legitimate fresh mint. not the kind of mint found in "mint chocolate chip." the scoops were huge, so i hardly touched the mango & strawberry... and instead just inhaled the lemon mint. delish. josh & i have already decided that two is our new favorite after-work-dinner-&-drinks-place near my office. he loved all of his dishes (hello, carnivores. eat here.) ... especially the honey-ricotta cheesecake for dessert. so whether you live nearby... or 100 miles away, check out two.